Just a week ago, we estimated that the harvest and fields were about 4 weeks behind due to our unusually cool and wet late spring and early summer. Needless to say, we were a bit stressed by it all. Thankfully, after these last few weeks and the especially high temperatures of last week, we are happy to report that this gap is closing. Now things seem just a couple of weeks behind, a much more managable spread! We even harvested the first summer squash this week, just a few for us, but this means by next week that whole roller coaster ride of summer will begin. Our eggplant, which we have kept covered, are looking to actually mature earlier than we are used to growing them without cover. And there are loads of tomatoes set, so we can hope for at least our average ripening time on these. Without cover, we can’t hope for early tomatoes here at Growing Wild Farm, but that is ok with us. We grow too many to cover on the ground like we are the eggplant, and we aren’t yet considering field hoop houses for these crops. Let’s see. The other crops that mean summer to us are trucking along too. The green beans are about 2 inches long and thin, so we should start harvesting them in the next few weeks, and the basil has seen its second harvest already. The only thing that is still more behind than we would like are cucumbers. We suffered a lot of loss when the extended slug season kept decimating the cucumber sprouts, so our stands are smaller than we would like. The sprouts that did make it just didn’t start thriving until it warmed up. Even with cover, they are just now starting to spread. We kind of had a lot of cucumbers for the CSA last year–in fact it was one of the few complaints we heard about from more than one member–so I guess we won’t feel too bad in the end if this year is a smaller than average harvest! And in these last two weeks we have began this year’s harvest of fruit from our own property! We have planted a lot of fruit, but not harvested much as we waited out these more long term plantings. 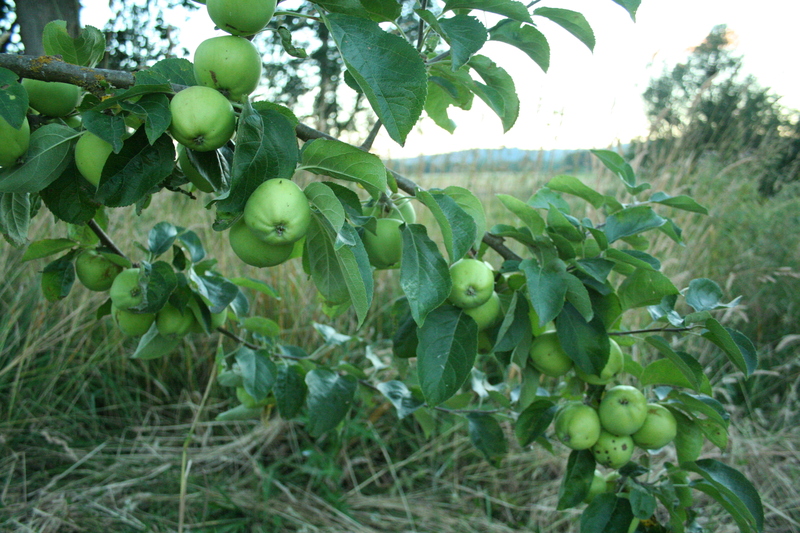 It is fun to begin to see the amount of fruit we will have, even though the harvests are still small and young. We have been taking gooseberries to market, something we were thrilled to offer, but as it turns out, not everyone is thrilled about. Many folks have deep, sweet memories of these fruits from another time, and they are excited to see them at market; but most of the contemporary folks taste them and pass them by. That’s ok, since I mostly covet all the fruit for our wildly fruit ravenous bunch on the farm anyways. There are loads of apples this year, and pears, and figs, and plums. Our raspberries and blueberries have been too neglected to begin producing for us. We may have to start over there, but we did plant a large strawberry patch this year that our brood of wild chickens are taking advantage of this year, which will help us take full advantage of the fruit next year. All in all, another rewarding week on the farm. It feels good to be getting close to that full abundance of summertime, as busy as that is for harvesting and processing and general fun-time havingness. The rewards of summer are so immense, just like the feel of the long and warm days and our pretty boundless energy. This time of year is so fleeting, we try to keep ourselves right here in the moment to enjoy every bit of it we can. We hope that all of you are too! Count me among the gooseberry devotees. I can usually find them in the wild but it was yummy decadence to find them at your stand at the market!